CattleToday's Q & A Boards are a Cattle Forum for swapping information and asking and answering questions about breed, health problems, beginners questions and jokes about cattle and horses. Discuss grasses and how to grow and harvest them. Oh Great Spirit, who made all races,look kindly upon the whole human family and take away the arrogance and hatred which separates us from our brothers. 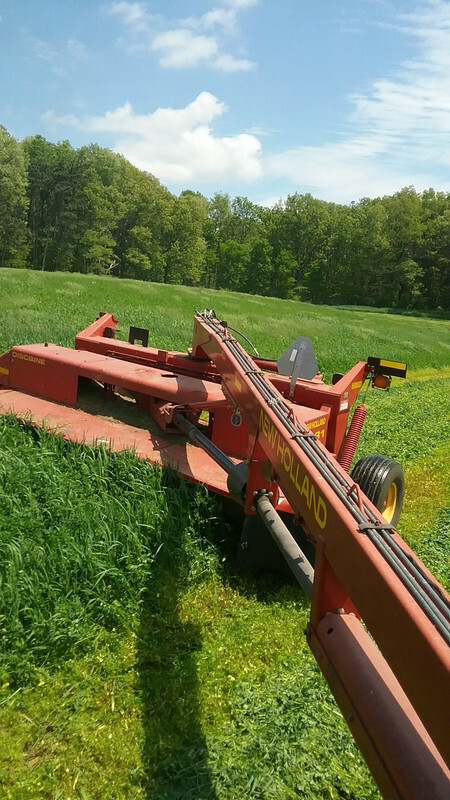 I'd like to be cutting hay but there is hardly anything worth cutting, nothing is really growing well UP here. We get hot weather and no rain so things dry up, then it rains a bunch and gets cold so things also don't grow. Just can't win these last few years. I got 127, 5x5 rolls, off 30 acres. I didn’t think that was too bad. It’s sad....I just got 13 5x5 rolls off 14 acres of Klein/Bermuda mix.....reminiscent of 2011 I say. Just not getting much when it does rain. Great picture: When your "stuff" is humming right along, cool breeze, fresh morning, doing what it was designed to do......life is good......."How Sweet it is" (Jacky Gleason...the Honeymooners). herofan wrote: I got 127, 5x5 rolls, off 30 acres. I didn’t think that was too bad. Thst’s about 4.2 rolls per acre. Does that sound about average for fescue/orchard grass? Little better than average Id say , with the 5x5. 57 4x4s on a 6acre field . Wow. I can’t believe I’m above average on production. We have always done 5x5, and I feel like I have a success story with this 30 acres. The fields had been neglected for several years. 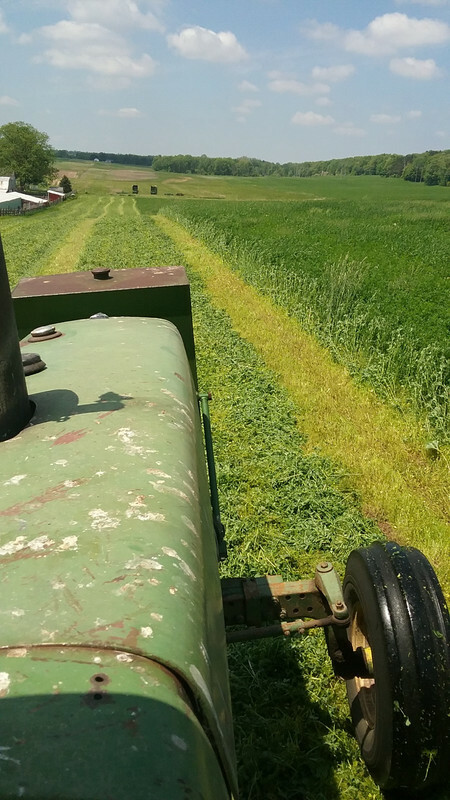 We started mowing it for hay again in 2011 and got 60 rolls off the 30 acres. Over the years, we have fertilized, seeded, and limed. Our yield gradually increased from 60 rolls to 127 the last two years. That’s great, because I only feed around 100 per winter. Put up 212 bales yesterday - in-line wrapped. 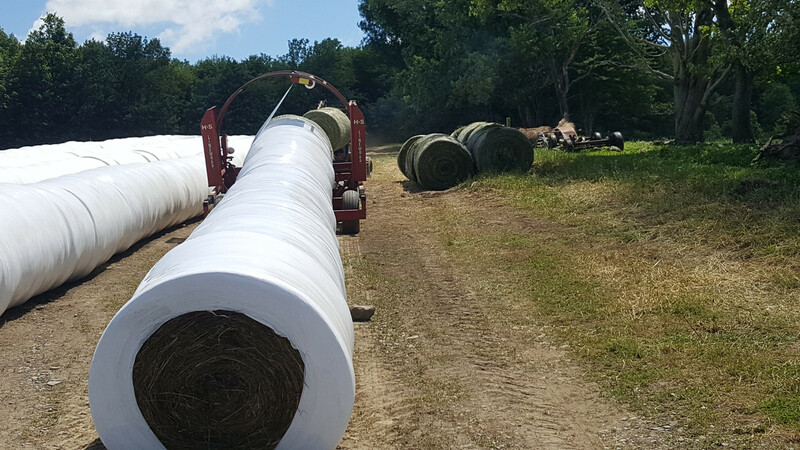 The wrapper takes 40 seconds per bale. Equipment is ancient, but very efficient. we make a life by what we give." That is a lot of hay Jeanne, the equiptment must be efficient. That wrapping sounds fast. Ken - yes. I think they started around 9:30 and finished about 2:30 (stopped for sit-down lunch). He has a wagon that picks up the bale, hauls 12 bales to wrapper. Drops them side by side in line. Uses an old skid steer. 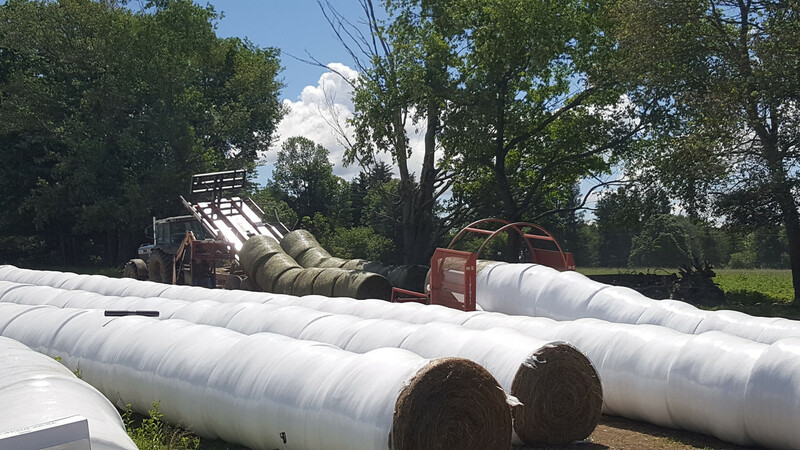 So, you stab a bale & get it to the wrapper, while it is wrapping. Normally, holding a bale there ready to put in place within the 40 seconds. So, normally, the 12 bales are wrapped waiting for the next load. I have seen 3 loads on ground when Phil starts wrapping and catches up with hauler. 5x5 roll = 1200 lb ? = 5k lb per acre. That is probably more then your area averages for the entire year with 2-3 cuttings. Here's a good look at the wagon dumping the bales. So it takes about 12 minutes (or less) to wrap a load. Takes longer for the wagon to get back from the field. 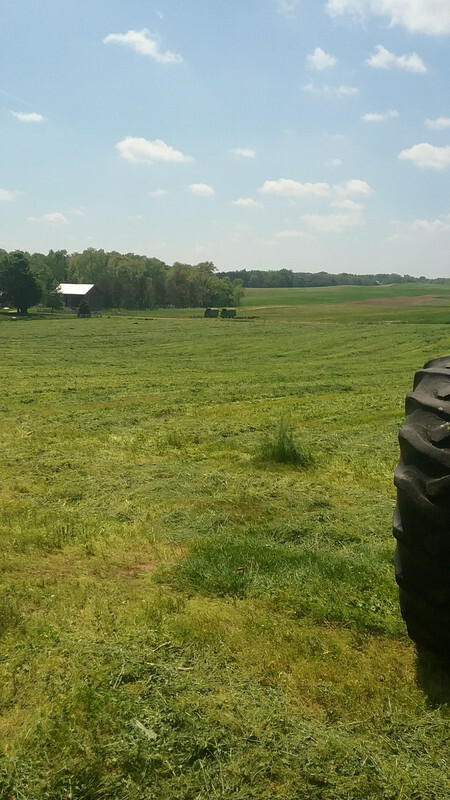 The got all the rest of my hay mowed yesterday, and will get it all cleaned up today. Jeanne - Simme Valley wrote: Here's a good look at the wagon dumping the bales. So it takes about 12 minutes (or less) to wrap a load. Takes longer for the wagon to get back from the field. The got all the rest of my hay mowed yesterday, and will get it all cleaned up today. Looking good... Winter supply done? ↳ Hi! I'm new here.